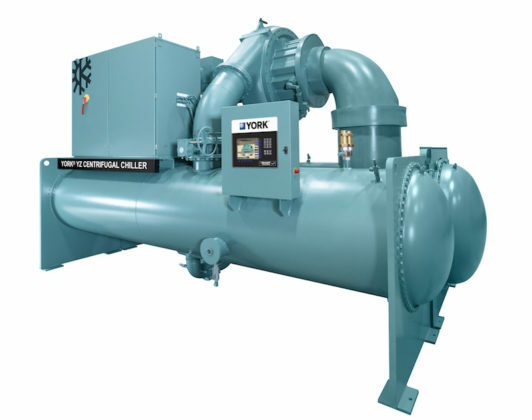 For 2019, Johnson Controls has extended the capacity range of its award-winning YORK® YZ Magnetic Bearing Centrifugal Chiller to include chillers beyond 1,000 tons (3,516 kW), now up to 1,350 tons (4747 kW) of refrigeration. In early 2018, the YORK® YZ Chiller was introduced to the HVAC market with a capacity range of 165 to 1,000 tons (580 to 3516 kW). It was the first chiller fully optimized for performance with a next generation low-global warming potential (GWP) refrigerant — R-1233zd(E). After capturing the 2019 AHR Innovation Award in the Cooling Category, the Johnson Controls booth showcased an extended capacity YORK® YZ Chiller unit at the 2019 AHR Expo earlier this month in Atlanta, GA. The extended capacity, AHRI-certified YORK® YZ Chiller uses an integral, variable speed drive and advanced magnetic bearing technology that features a single moving assembly suspended in a magnetic field that does not require lubrication. This technology requires 80% fewer moving parts than traditional oil or refrigerant-lubricated drivelines. The result is enhanced reliability, reduced maintenance and improved efficiency.